The Earth is blue. How wonderful. It is amazing. And amazing it was. It was an obvious thing to say, but it was spoken from an honest heart, touched, and humbled by the breathtaking view of his true home. 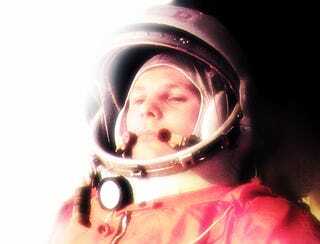 Born son of a peasant in Klushino, Russia, Gagarin was the first man to reach space and the first to orbit Earth. When he said that phrase he was orbiting from an altitude of 300 kilometers over the surface of our home planet, expressing the exact same feeling that every single astronaut has had since then. A sentiment of total awe at the beauty of our little planet. Reaching for the stars, Gagarin and the rest of the Humanity realized how unique and precious Earth is. His feat was amazing at the time. The US was stunned at the news and NASA rushed to get an astronaut into space. It wasn't until May 5, 1961, that Alan Shepard was rushed into space to became the first US astronaut, following a ballistic missile trajectory. It wasn't until the next year that the US put an astronaut in orbit, when John Glenn circled the Earth for 4 hours, 55 minutes, and 23 seconds aboard the Friendship 7 on February 20, 1962. Sadly for him, after becoming a hero of the Soviet Union, Gagarin was grounded forever, too precious to be lost for the propaganda machinery of the draconian communist regime. He returned to Star City—where the Soviet Union developed their space program—to work on reusable spacecraft designs, but he never got into one himself again. In fact, after Vladimir Komarov died in the the first Soyuz flight, Gagarin—who was his backup pilot—was even banned from training for spaceflight. It was ironic because only a few years later Gagarin died in a routine fighter pilot training flight, on March 27, 1968, aged 34. A tragic loss, no doubt, of a true hero not only for the Soviet Union, but for the entire world. They don't make them like these anymore.